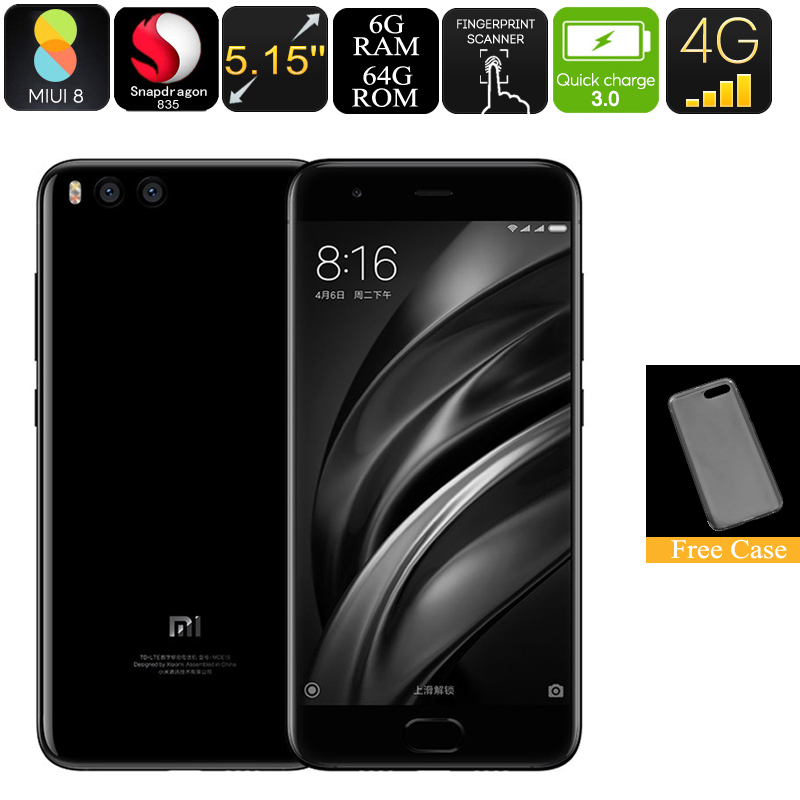 Successfully Added Xiaomi Mi6 Android Phone - 6GB RAM, Snapdragon CPU, NFC, Fingerprint Scanner, 4G, Dual Rear Camera, Quick Charge (Black) to your Shopping Cart. The Mi6 is the latest flagship Smartphone from top Chinese phone manufacturers Xiaomi. This coveted phone brings together high end specs for an insanely good price, a tactic that has lead to their dominance in the Asian smartphone market. The Mi 6 has a really high end finish with a metal frame and glass body that really shines. At only 7.5mm thick this masterpiece of design sites comfortably in your hand and has a very premium feel. Boasting a 5.15 Inch IPS screen with full HD resolutions the Mi 6 crams in a whopping 428 pixels per inch. This bright display brings you a pin sharp image and with the superb color depth you'll the vibrant MIUI interface really pops. Beneath the lush display is a home button that has a built in fingerprint scanner. This registers your finger in a split second and unlocking the phone is instant. All this is covered by a curved glass surface that brings a glossy smooth feel to the front and rear of the device. The phone comes with a thin and transparent TPU cover that wont take away from the design but will prevent the phone from slipping out of your hand. Beneath the surface of this Android phone is the powerful Snapdragon 835 CPU clocked at 2.45GHz and 6GB of RAM giving the Mi 6 a lightening quick performance. The 3250mAh battery is fairly large considering the screen size and brings oodles of juice so you can enjoy hours of games, movies talk time and web browsing from a single charge. Taking advantage of Quick Charge 3.0 technology lets you recharge the phone in as little as 3 hours. The rear camera on this Android phone has a wide angle lens and sports 4-axis stabilization. with a telephoto secondary camera you get a 2x optical zoom and the results are truly impressive. The MIUI 8 operating system on this phone is based on Android 7.1.1 brining all the latest features you'd expect from a flagship device. Having 2 SIM card slots, that can be used simultaneously, this Android phone offers great connectivity. It supports a good range of 4G bandwidths with B1,B3, B5, B7, B8, B38, B39, B40, and B41 all available so you'll finds there's great global network coverage. This gadget comes with 12 months warranty, brought to you by the leader in electronic devices as well as wholesale cool gadgets..